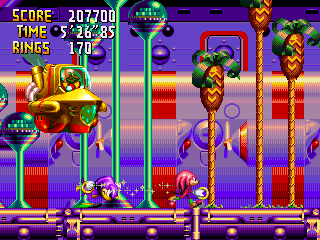 The boss battle of Chaotix's Marina Madness Act 5 finds Robotnik in a flying mech protected by a crystalline shield. After flying around the arena attempting to hit the player with the shield, Robotnik separates the shield into several blades and whirls them around the mech. The player must jump past the blades to damage the mech and the Dark Ring within. This page was last edited on 8 April 2018, at 08:45.